This is an English locational surname, which originates from either or both of the two places called Horley in the counties of Oxfordshire and Surrey. The original meaning of the place name is obscure, the Oxford Dictionary of English Place Names being unable to provide a satisfactory explanation. 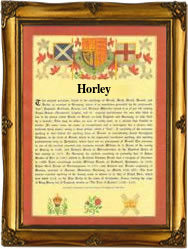 The first known recording is believed to be that of Hornly as spelt, in Surrey in the year 1262. This spelling would seem to be from the Olde English "Horn leah" which could mean either the "horn shaped leah", with leah being an area of land cleared for agriculture, which would seem to be the most likely explanation, or a leah owned or occupied by a person called Horn. Locational surnames were those given either to the local landowner or lord of the manor, or to a person who for whatever reason, had moved somewhere else. The easiest way to identify such strangers, was to call them after their original homes. In this case the first recordings could be either as both are of landowners but outside of their original counties. These are Walter de Horley of Bedfordshire, in the Hundred roll of landowners of that county, whilst Phillp de Horlegge is recorded in the Hundred rolls of the county of Norfolk, both in 1273.